Hot peppers are among the highlights of New Mexican cooking, so when in Santa Fe, I buy them in various forms. Last year I found a guy selling his own peppers by the side of the road near Chimayo and bought some items. I wasn't sure I could find him again, but there he was, on Rte 76 West of Chimayo. This year I chatted with him at some length, and found out that he is Earl Sherwood. Earl is pretty excited about his peppers, and offered me tastes that enabled me to make intelligent choices. Earl's extra hot crushed red peppers are, of course, hot, but they also have a sweet, paprika-like taste that really got my attention. Earl says to add them to slow cooked pork during the last hours of cooking, and that is what I plan to do. I also bought some hot green pepper powder. Exciting on the tip of the finger - think about the essence of a poblano pepper, but hotter - but what to do with it? This will require some research into Mexican and Southwestern dishes; I'll let you know what I find out. 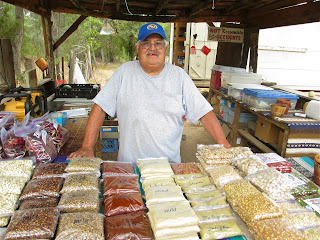 I bought some hot green chile peanut brittle bars, which Earl sells but does not make himself. Still awfully good: the salty peanut and spicy pepper tastes complement each other perfectly. In order to save some buying (storage) capacity for the Santa Fe farmers market, I left it at that with Earl, but am already looking forward to seeing him again.